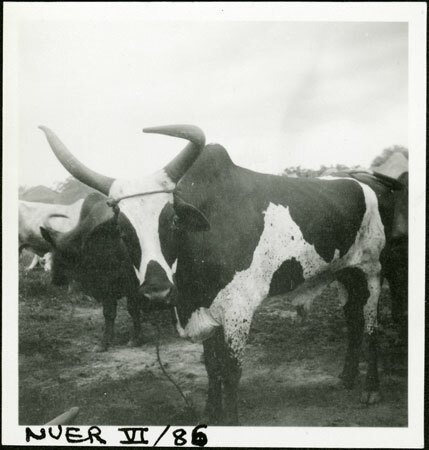 A portrait of an impressive ox with mottled markings and a trained left horn curving over its muzzle (known as ma gut), a process carried out by by Nuer men by cutting away at one side of the horn on their favourite beasts, for aesthetically pleasing effects. This training is mirrored in the male practice of binding the left arm with metal bands called thiau, both of which are often carried out soon after initiation. The location is almost certainly amongst the Lou at Yakwach village on the Sobat River. Note on print reverse ms pencil - "43 6 A108" & print front border ms ink - "NUER VI/86"
Morton, Chris. "Nuer ox with trained horn" Southern Sudan Project (in development). 03 Jan. 2006. Pitt Rivers Museum. <http://southernsudan.prm.ox.ac.uk/details/1998.355.290.2/>.